I have been making and decorating cakes for about 7 years for family and friends. If you give me a picture I can most likely make it. This cake was for my Grandsons 7th birthday. He loves anything Minecraft. This cake was a little challenging. It is an 8 inch four squared layered chocolate cake covered with homemade butter cream icing. I cut out 616 half inch squares if fondant in colors of brown, tan, green and light green. The top of the cake is covered in homemade butter cream icing colored green using the grass tip. The figures are stock card printouts I printed out using my computer. I used four dowel rods to secure the layers for transport. 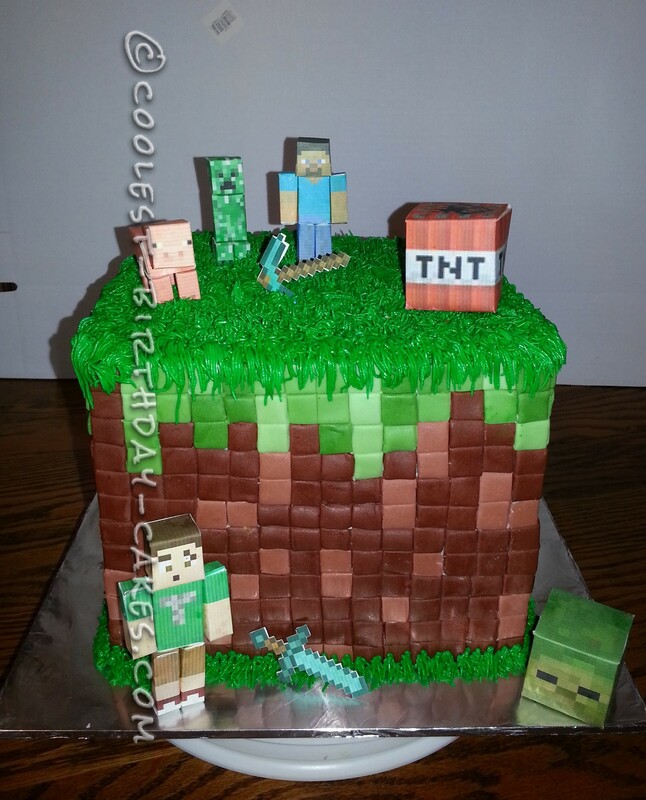 Any child or adult who loves Minecraft will loves this cake. My grandson didn’t want to cut the cake.